South Carolina is Sweet 16-bound for the first time since 1973. The seventh-seeded South Carolina Gamecocks are headed to the Sweet 16 in the East Region. 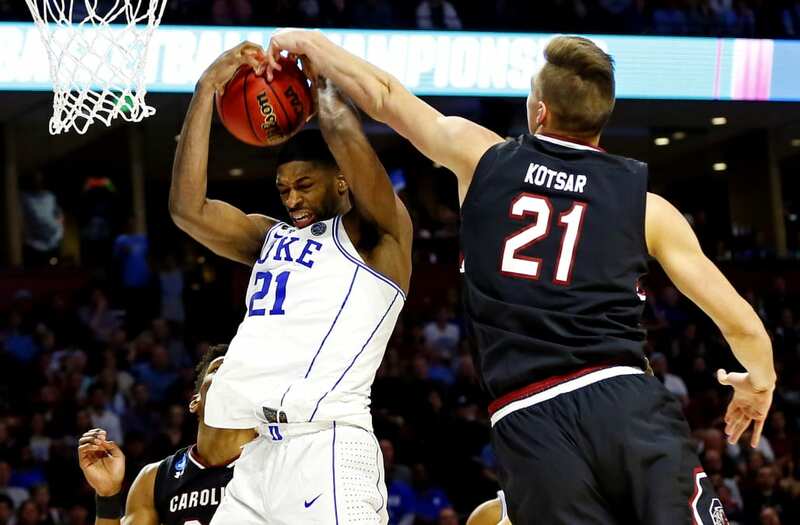 The Gamecocks stunned second-seeded Duke, the national title favorite, 88-81 in Greenville, S.C. Sunday night. The Gamecocks forced 18 Duke turnovers, and rebounded from early shooting struggles to trail only by seven at halftime, 30-23. In the first 20 minutes, SC shot 7-for-35. In the second half, South Carolina exploded for 65 points and seemingly hitting almost every shot. Sindarius Thornwell, the SEC Player of the Year, led the Gamecocks with 24 points. Guard Duane Notice and forward Chris Silva added 17 apiece. The Gamecocks had five players in double-figures, and shot 27-for-32 from the free throw line. Duke also had five players in double-figures, led by Grayson Allen's 20 points off the bench, but the Blue Devils looked out of rhythm offensively. Guard Luke Kennard shot just 1-of-6, and freshman star Jayson Tatum produced a "quiet" 15 points. Due to the controversial HB2 bill, this regional was moved out of North Carolina to Greenville, giving the Gamecocks two games in front of a friendly crowd. Still, it was the players on the court that won the game, and Duke was thoroughly outplayed, no matter where the game was. South Carolina will now play Baylor in the East Region semifinals at Madison Square Garden on Friday. The winner of that game will face either Wisconsin or Florida. The post No. 7 Seed South Carolina Stuns No. 2 Seed Duke To Advance To Sweet 16 appeared first on The Spun.